A ruby-throated hummingbird shows off its gorget on an unusual hibiscus perch at Shaw Nature Reserve. Joyce and I took a nice hike at Shaw Nature Reserve this morning, beginning right at daylight. The forecast was mostly cloudy so I knew we could hike both the wetland area and the wildflower garden before the sun became an issue for photography. We started at the wetland trail and didn’t get very far before I captured an image of a brown-headed cowbird among some prairie stems. Cowbirds are notorious for laying their eggs in the nest of another species, thus obtaining free nursery care, but I’ve always found them beautiful, especially their rich, brown heads. The image below was shot in rather low light at a slow shutter speed, but fortunately the cowbird, a male, was very still. 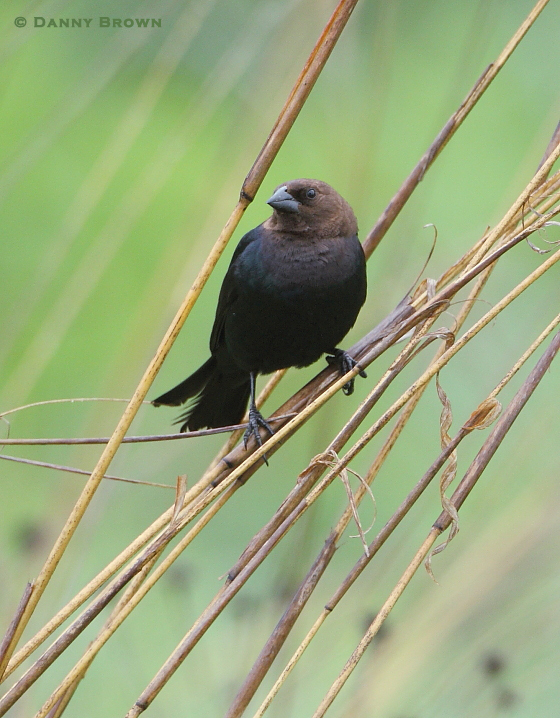 A brown-headed cowbird welcomes us to the Wetland Trail. As we worked our way closer to the wetland, I stopped along the way to photograph a few prairie flowers, still covered with dew, including bunch flowers and a black-eyed Susans. Bunch flowers. 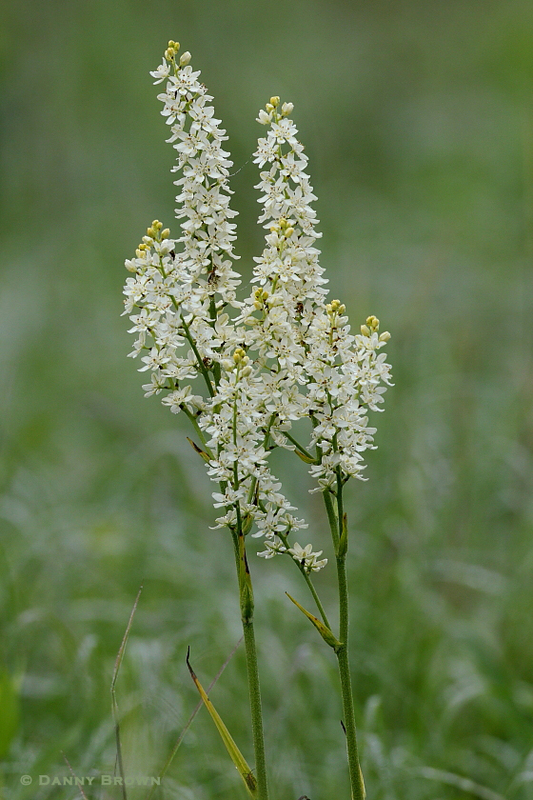 Although unrelated, they always make me think of Bear Grass from out west. 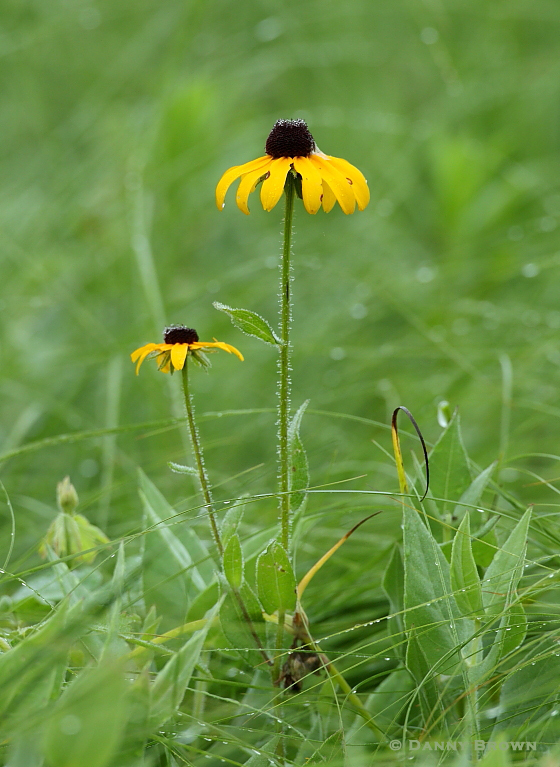 Black-eyed Susans add a splash of joy to the prairie at Shaw Nature Reserve. As we rounded the bend near the wetland, I got a clear view of the photography blind which is situated nicely along the shoreline. More and more photographers are taking advantage of this newish addition to the area although I prefer sitting on the ground in thick vegetation, back to a tree and hidden from both critters and people. 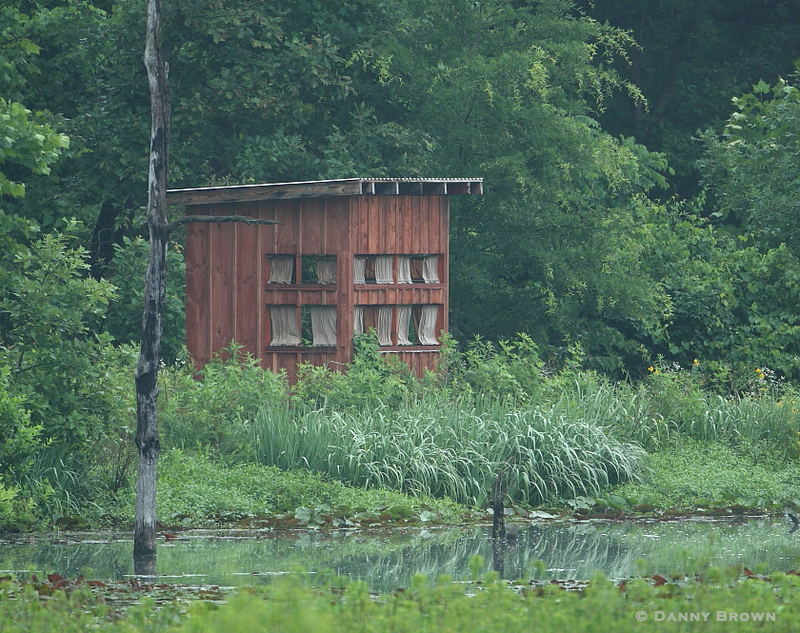 The photography blind along the wetland shore. We had a pleasant walk around the wetland and back to the 4Runner for the next hour or so. It was so cool that I didn’t even break a sweat, which is rarely the case during a summer hike. I loaded my gear and we headed to the other side of the area to see what was what at the Whitmire Wildflower Garden. We were greeted by a red-shouldered hawk, standing sentry to the garden’s entrance. 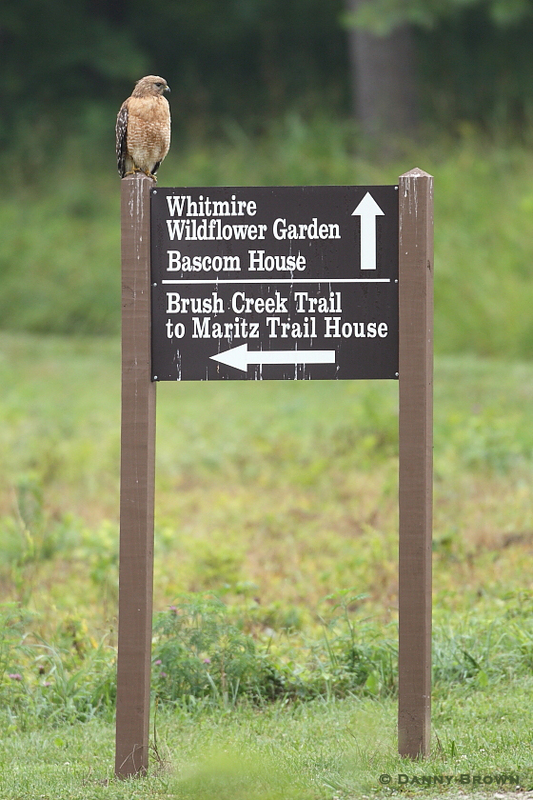 A red-shouldered hawk welcomes us to the Whitmire Wildflower Garden. 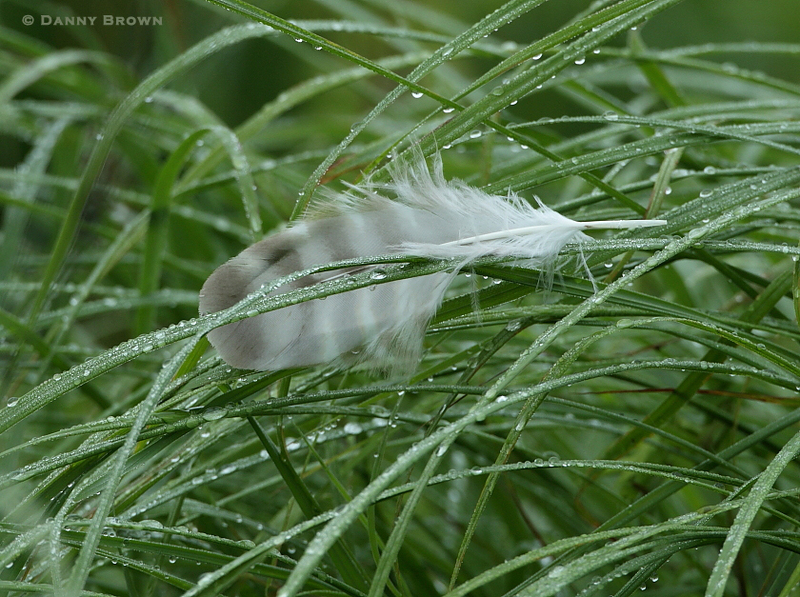 Just past the entrance, and the hawk, I saw a feather, probably from the same hawk, in the prairie grass. I had to take a photograph, for art’s sake. An art shot of a hawk feather. We walked around the garden for a while, taking notes on ways to improve our own wildflower garden and prairie. After talking to one of the staff members, “James the Younger,” about button bush plants, we headed down to the lotus pond near Brush Creek Trail. 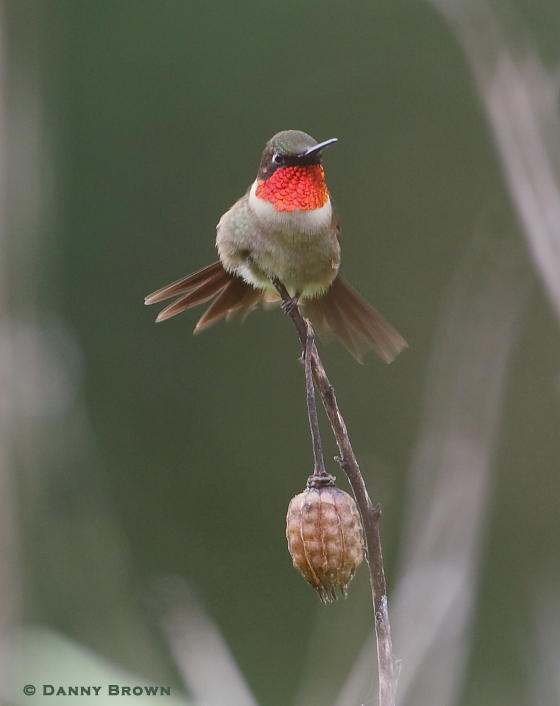 As soon as I took my tripod down from my shoulder, Joyce saw a male ruby-throated hummingbird land on a hibiscus stem. I swung my camera around and made the featured image before the hummingbird took off, seconds later. It was still cloudy and the perch was rather dark but the hummingbird’s gorget glowed orange-red in the morning light. 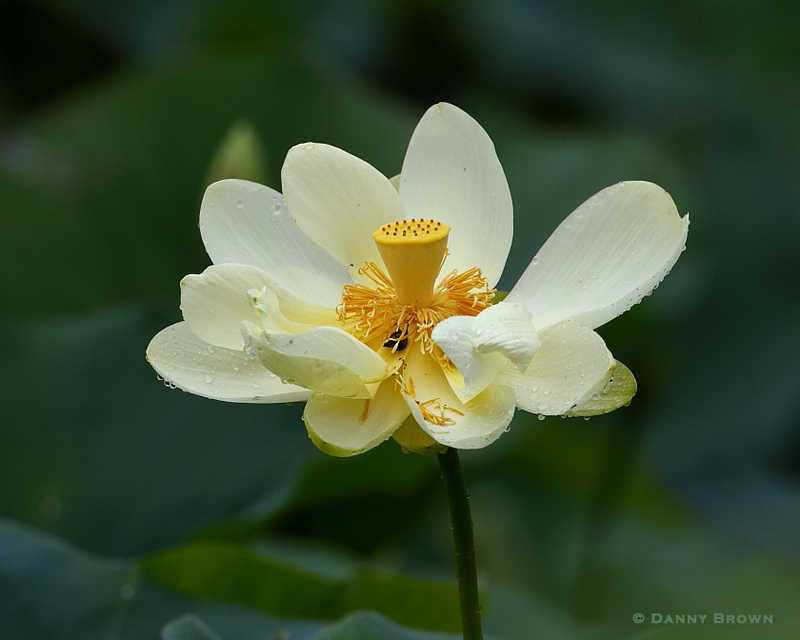 I waited a while for the hummingbird to come back but finally began making some images of the stunning lotus flowers in the pond. The image below was one of my favorites. 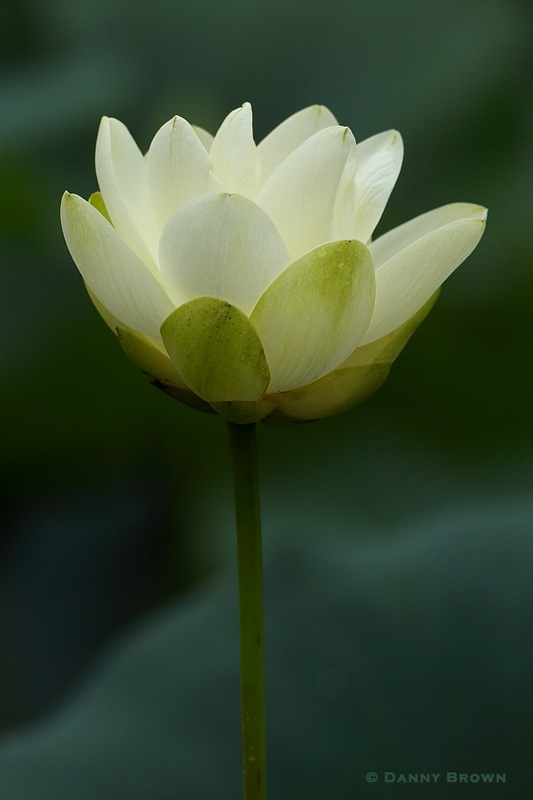 A single lotus flower, stunning, absorbs the light of morning. Detail of a lotus flower. Notice the tell-tale seed pod, an inverted shower head. Finally, we walked back up the hill to the wildflower garden where I saw a rangy cottontail on the mulched trail near the garden’s pond. 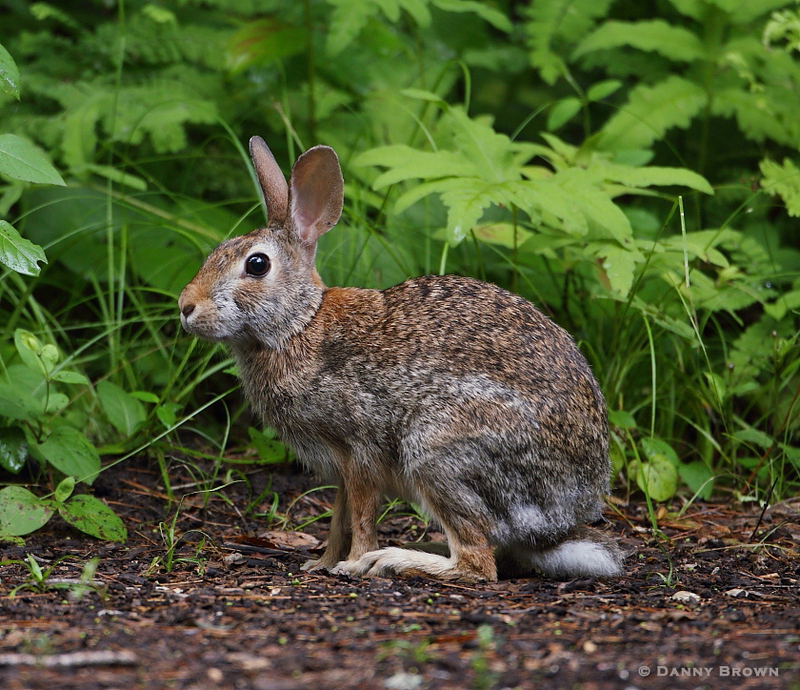 A summer cottontail, all legs and ears, hanging out near the pond in the wildflower garden. As usual, we found a few red-eared sliders basking on logs around the pond. I couldn’t resist a few images such as the one below. My friend, Matt Ormsby, let me know it was a western painted turtle. 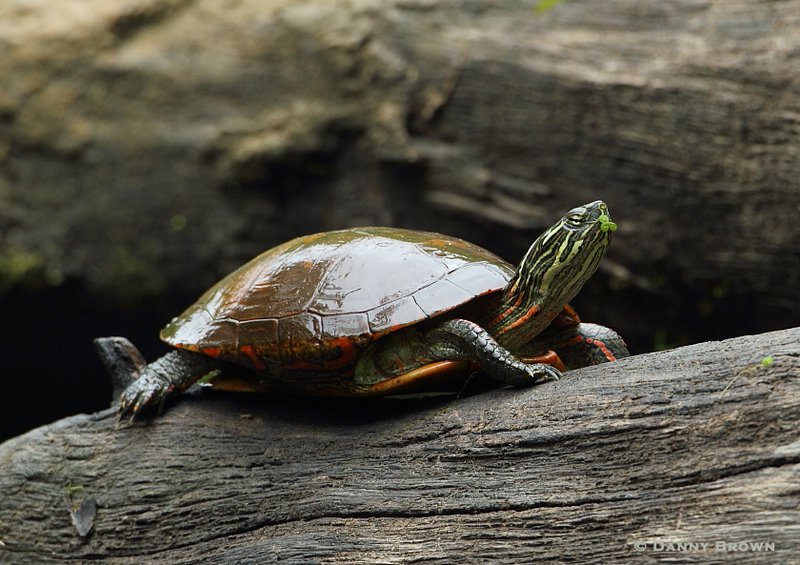 An image of a western painted turtle, taken from a low angle, my favorite point of view for most critters. We ambled on up the hill from the pond and eventually made our way back to the 4Runner. We made a stop on the way home for a quick cup of coffee with Aileen and Bailie at the Dana Center and then headed for St. Clair, Missouri, for breakfast at Lewis Cafe, which in my opinion serves the best breakfast in Missouri, or the midwest for that matter. I had sausage and eggs instead of my usual ribeye steak and eggs because I had just partaken in the latter during Joyce’s recent trip to Arkansas with her friend, Laurie. I was fending for myself, you see, so Lewis Cafe was necessary to my survival. As I write this, it is already after 3:00 in the afternoon. Wow, where did the day go? I can’t believe it’s already time for our mid-afternoon gin and tonics. Sometimes I think we live in an Ernest Hemmingway novel, and I really kind of like it. Note: Tickets go on sale for my next presentation at the Bryan Haynes Gallery in Washington, Missouri on July 8. I’ll send out the link ticket purchase when it is released. The presentation will be on Saturday evening, July 21. I predict we we have a wonderful time celebrating Missouri wildlife. Such lovely images… make me nostalgic about how much I enjoyed the natural beauty of Missouri.Thank you for introducing me to some of the most beautiful spots!